I know I haven’t shown it live FOREVER, because in the year and half since we moved in, we haven’t really done anything in this room. 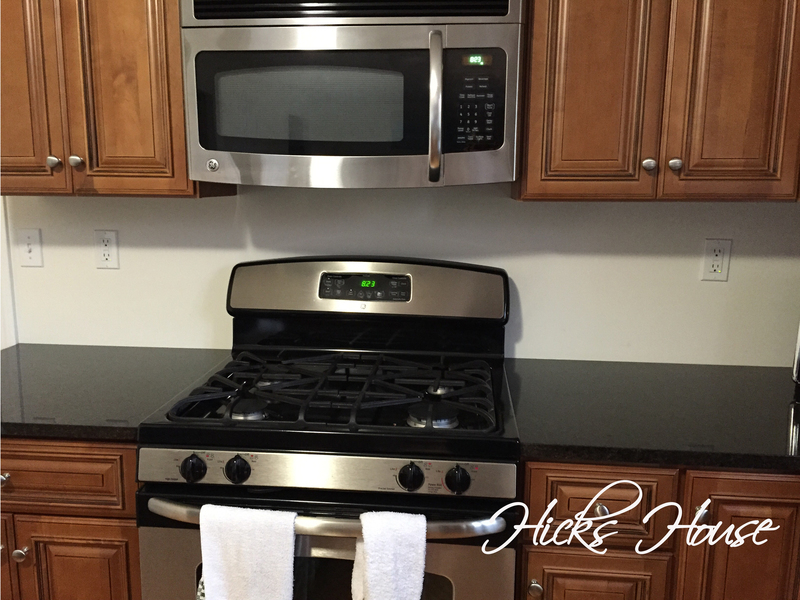 But now we have a BACKSPLASH!!! 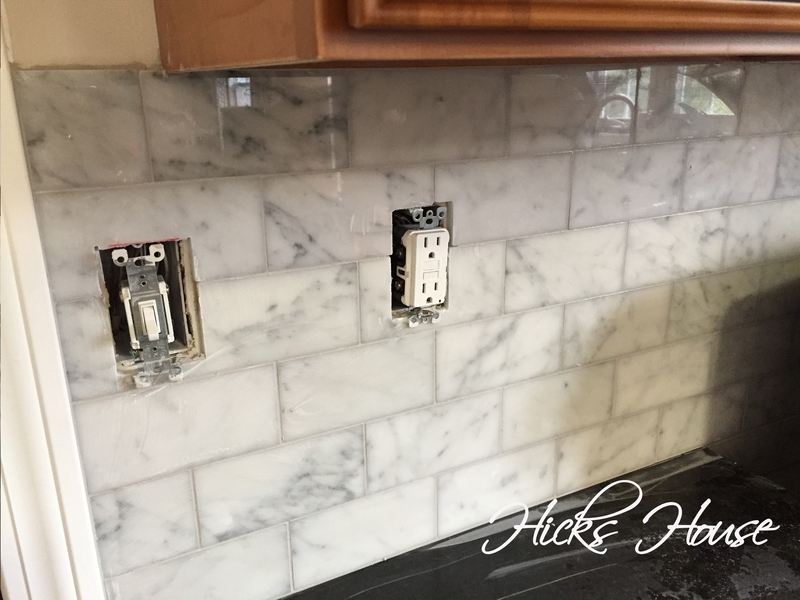 And not just any backsplash, a white marble one. It was definitely worth the wait. 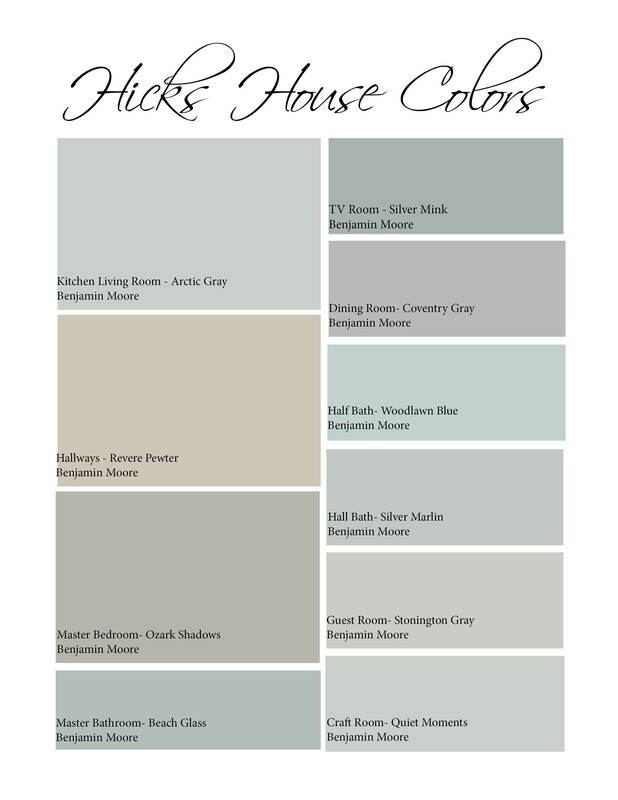 Once we get this room painted with the Arctic Gray, it will pop more than it currently does against the builder white walls (wah-wah). A few reasons this took over a year 1. tile is expensive 2. deciding on a tile style, color and material is hard (it’s a big and more permanent decision than any of the updates we’ve made so far) 3. it was job we didn’t want to tackle ourselves. Let’s start with some close-ups of the wall pre tile. 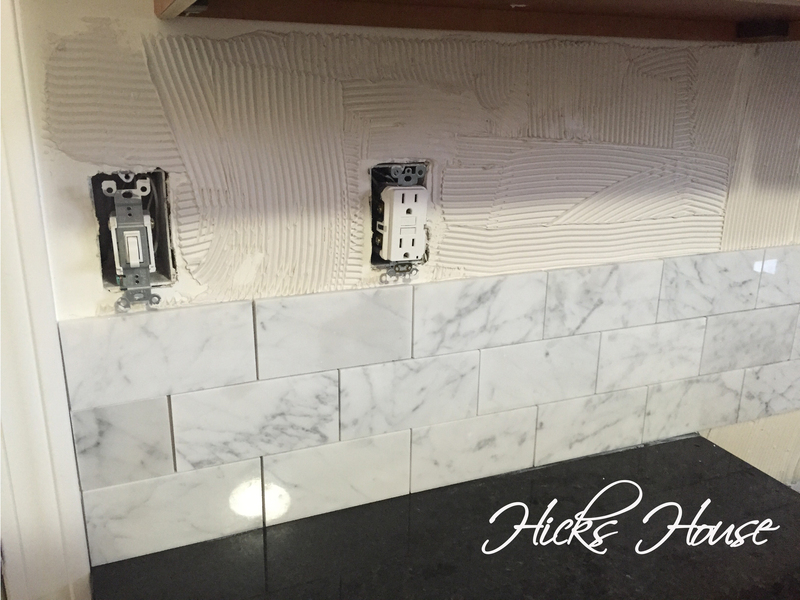 We decided to go with a white Bianca Cararra marble in a subway tile pattern. We thought the white marble would play off nicely with the black granite and matched our more clean and modern style, while the subway pattern was more classic ensuring we won’t tire of it too quickly. 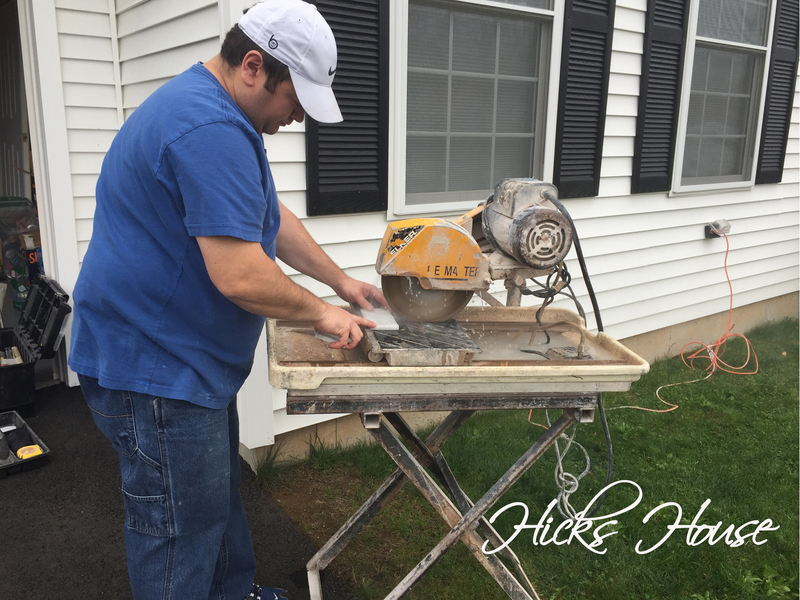 The tile guy came over equipped with a wet saw (unfortunately it was freezing) and set up in the driveway cutting a few pieces in half before getting started. 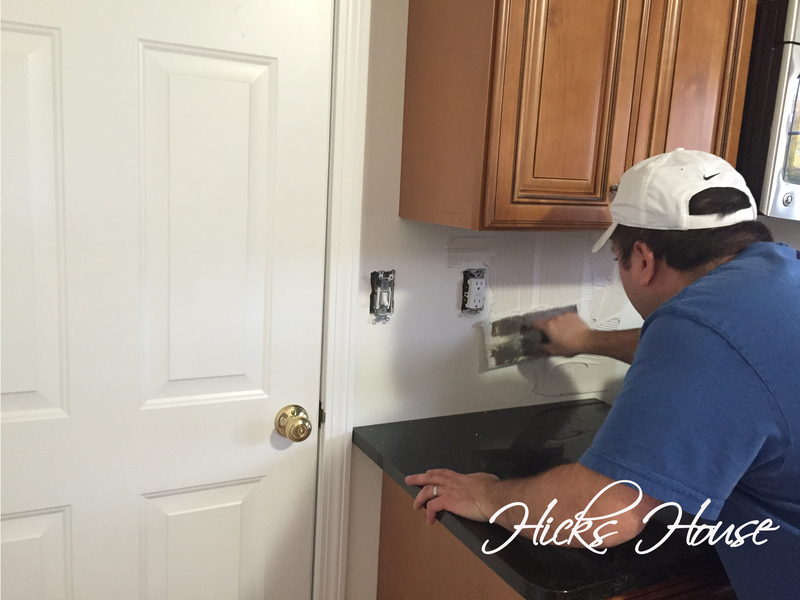 Then mixed up some mastic and started applying it to the wall in small sections. The tiles stuck right to it, which he laid out in the subway pattern. These tiles, being real stone were pretty thick and heavy so they started to kind of shift around. a few spacers took care of that. 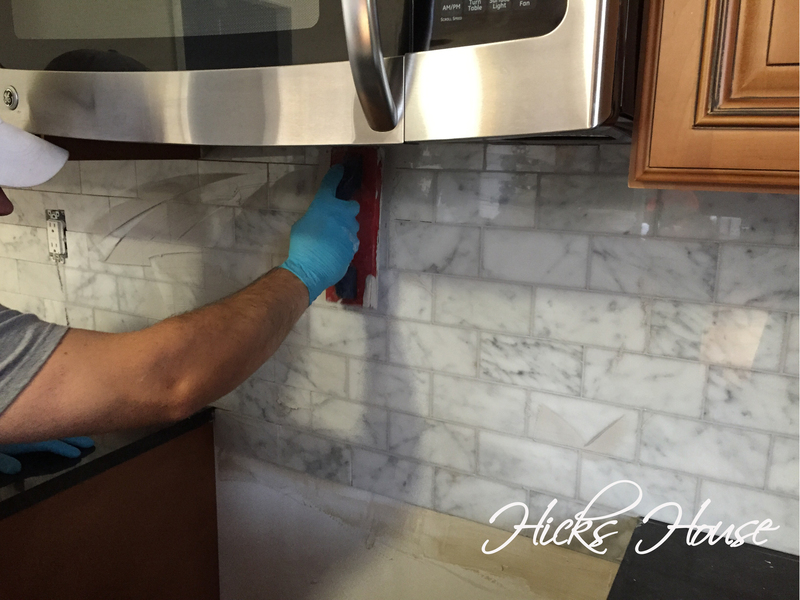 Once the entire area was complete we had to let it dry for a day to fully set in before the grouting could begin. We went with a grout color called frost, it was a grayish white, although we originally planned on going with white it just seemed so stark. The frost gave the effect of blending in more with the tile making it disappear rather than stand out. It was spread on with a trowel then wiped off with a damp sponge. Here it is right after the grouting was complete. 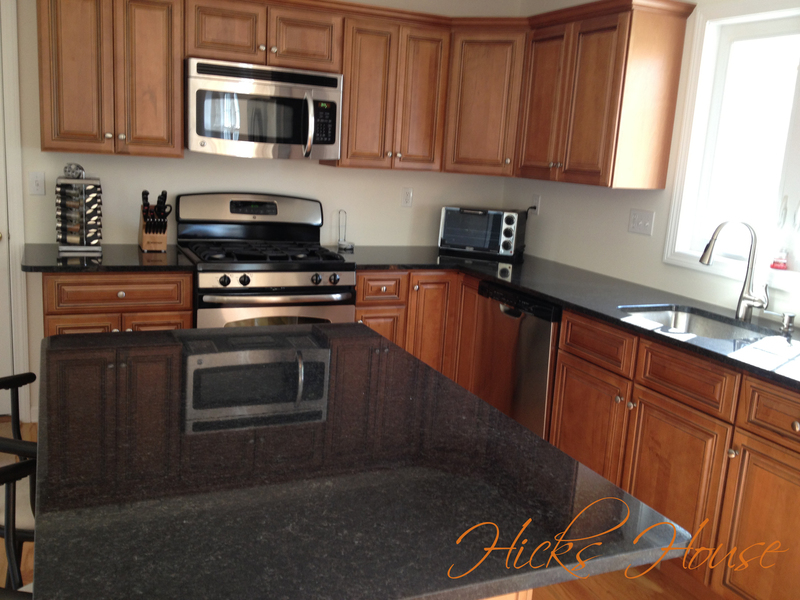 You can see the haze it left all over the tile and the countertop. 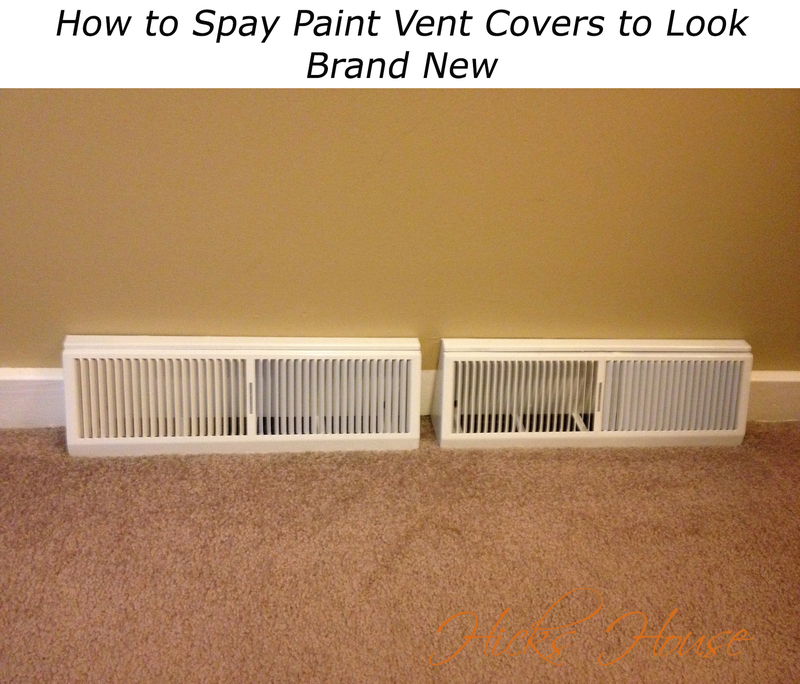 I buffed it out with a clean dry cloth. 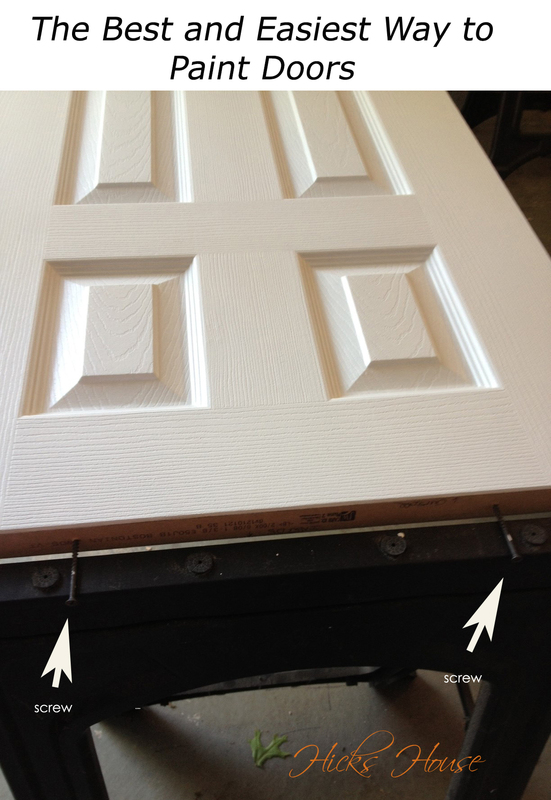 After it was completely buffed clean, Ken used a liquid sealer to seal everything in place. We used polished marble tiles, so this step wasn’t entirely necessary, but with white tiles it made us feel better that they would remain stain free. 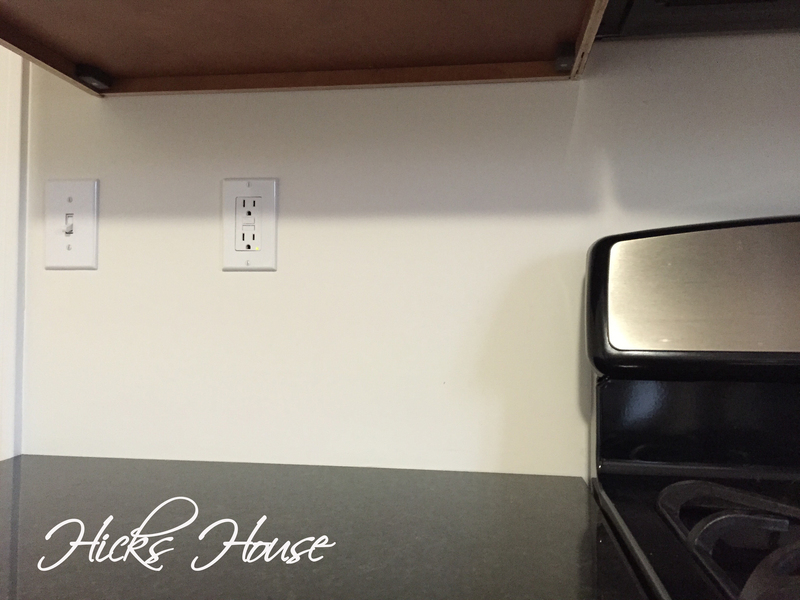 Because of the thickness of the tile, we had to purchase longer screws to put the outlet covers back on. This picture appears pretty dark because we’re in need of some under cabinet lighting… but you can see all the great veining and variety in the tiles. It was all done in time for us to host Thanksgiving last week! Now we just need to paint, add some under cabinet lighting, change out all the light fixtures and make a roman shade for the window over the sink. So what do you think? 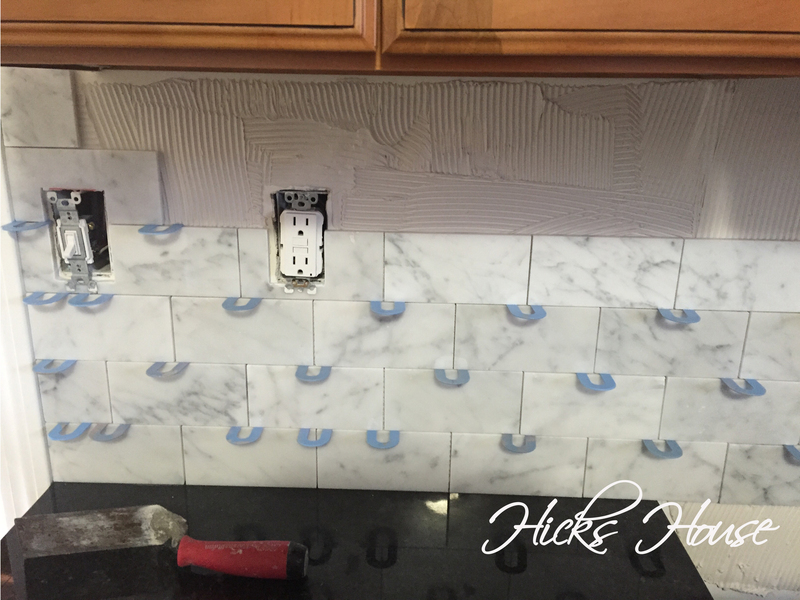 What do you have as a backsplash, or are you still figuring out what type of material to use? 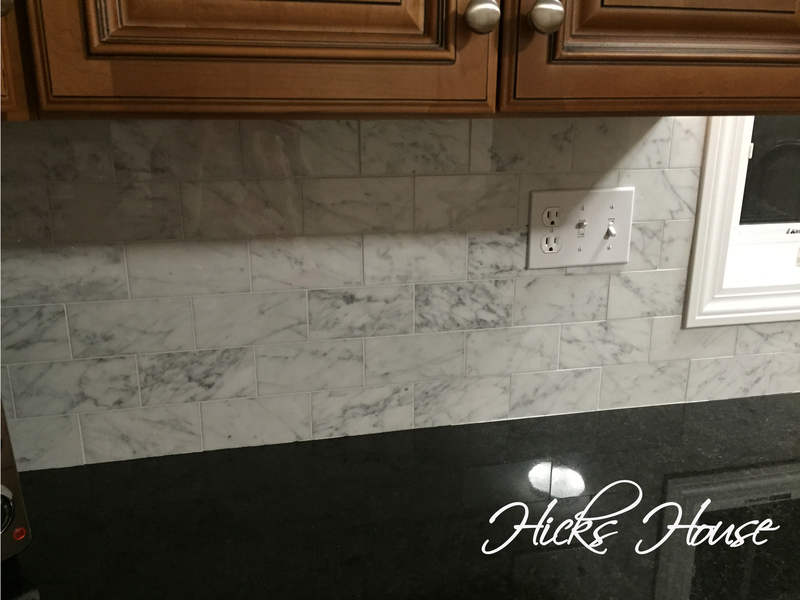 Categories: Kitchen, The Hicks | Tags: backsplash, carrara marble backsplash, installing kitchen backsplash, kitchen update, marble backsplash, white marble | Permalink. I am fully aware, that my recipes are the least popular section of this blog and for those of you who read this for house updates, maybe you should just come back next week mmmkay? Anyhoo, this recipe is adapted from Mountain Mamma Cooks. I stumbled upon it on Pinterest and thought it sounded like the perfect fall meal, it was just missing something and that something was sausage. 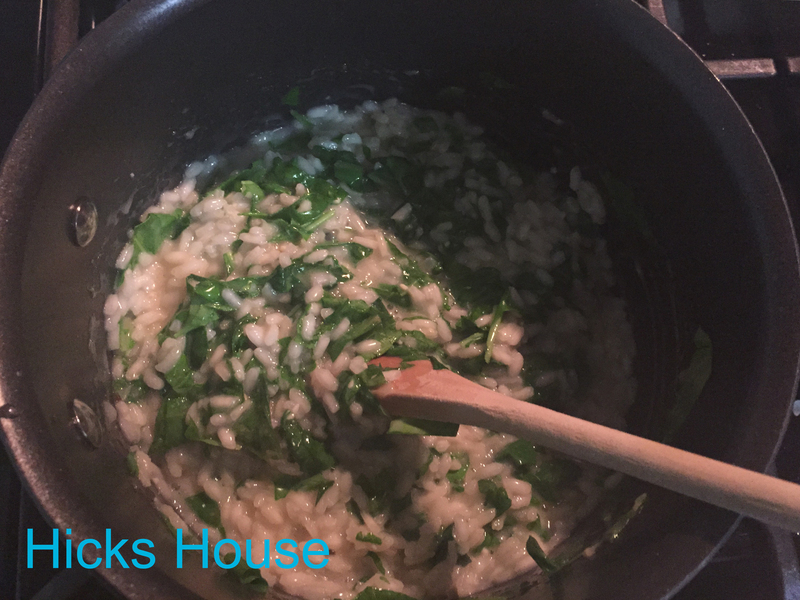 I also did not use barley, as I’ve never cooked with that before and had regular arborio risotto on hand. 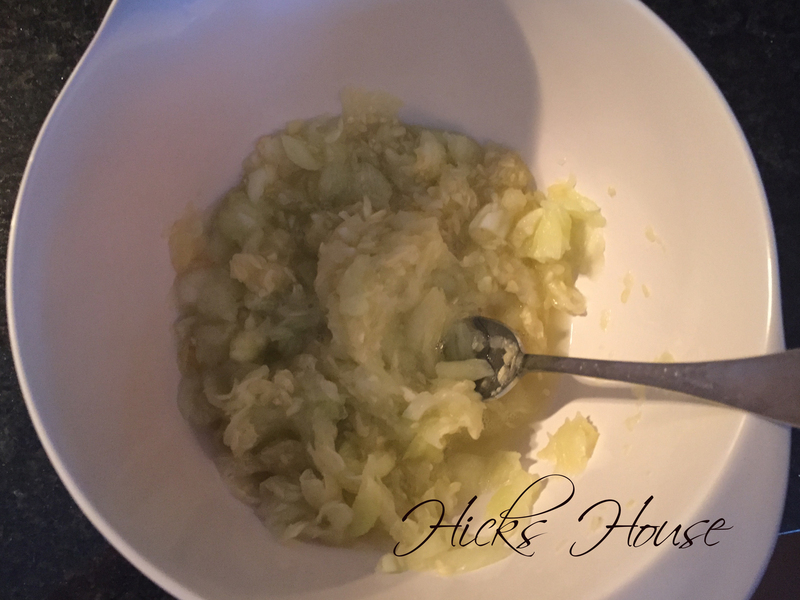 Over medium heat, add 1-2 tablespoons of oil to a medium pot, once hot add onions and saute until they begin to become translucent. Add garlic and risotto and stir for about a minute, the risotto will start to look sort of “wet” from the oil. Add the white wine. Don’t waste the rest of the bottle – pour yourself a glass too… Reduce heat to medium/medium low. You want to keep it at a slow simmer, but not so hot that all the liquid burns off immediately. 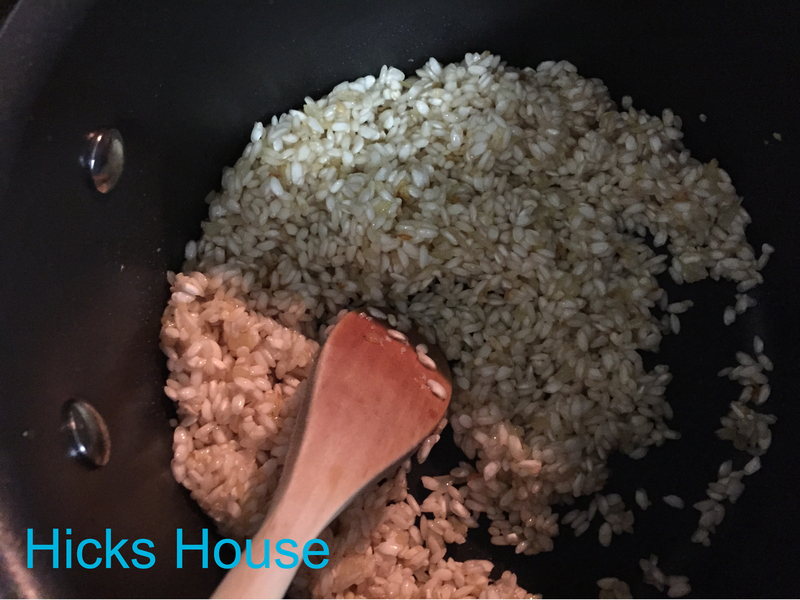 Stir regularly (I cannot stress this enough – it is the single most important step when making risotto). When the wine is mostly absorbed, add about a 1/2 cup broth and continue adding broth whenever it is just about absorbed. 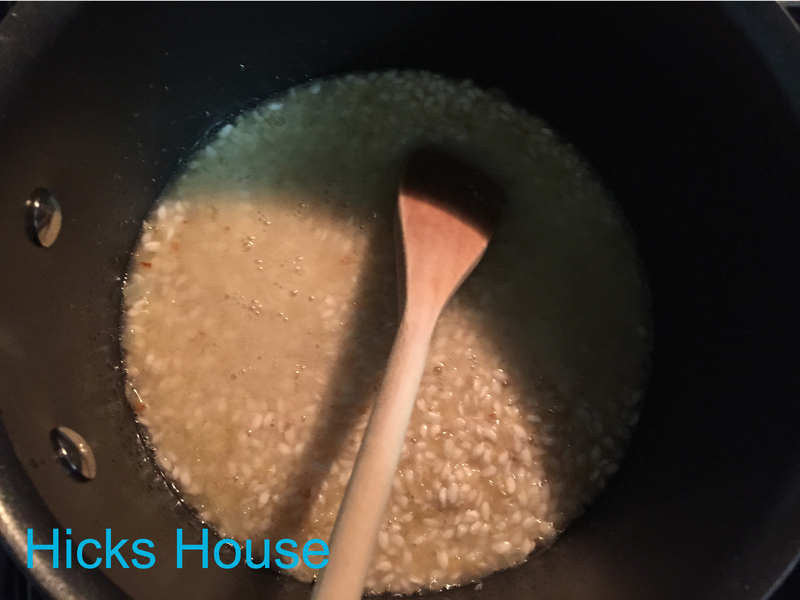 Many recipes I’ve read say to heat your broth when making risotto, I tried this the first time and found it more difficult to add in than pouring right from the box and didn’t notice a difference in the end result. 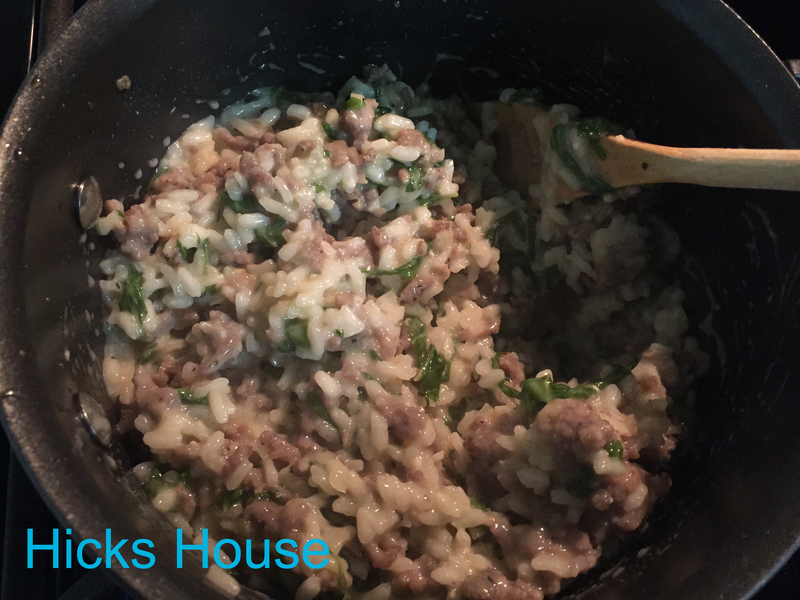 About 15 minutes into your risotto, you can begin browning your sausage. If you’re a super multi-tasker like I am (wink wink) you can stir both at the same time – one with each hand. to the consistency you like add your last round of broth and the sliced kale. 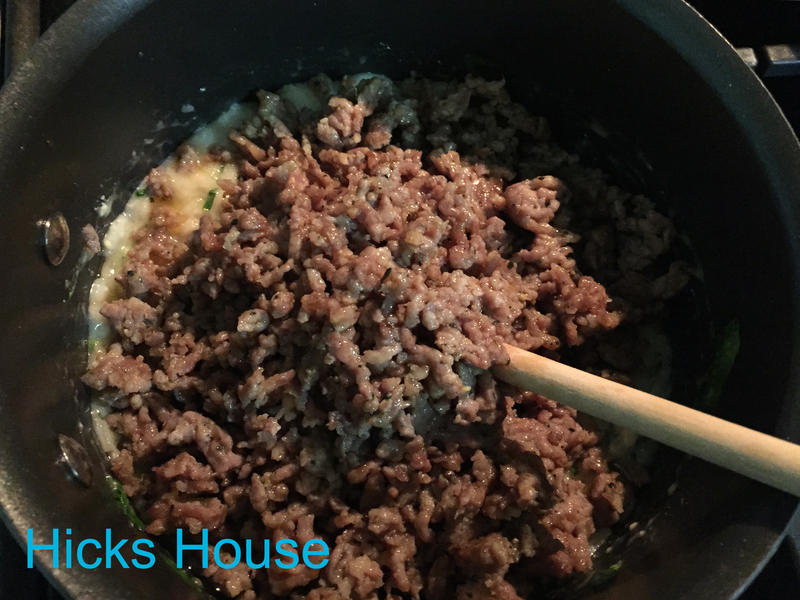 Mix well, until wilted add the sausage and parmesean cheese and stir. 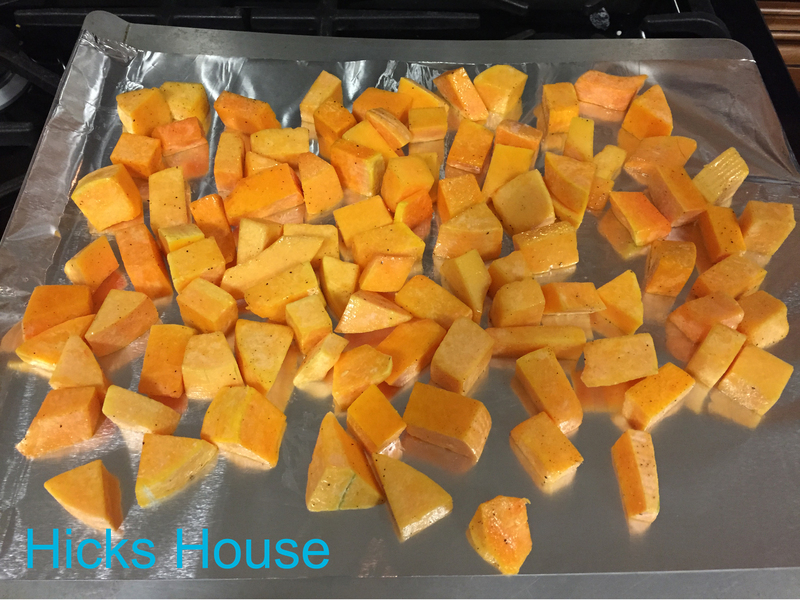 My butternut squash timer went off about 15 minutes before I reached this step, but I didn’t think it was “done” enough so I left it in the oven. (I’m not sure you can over-roast squash). Once your squash is easily pierced with a fork it’s done. 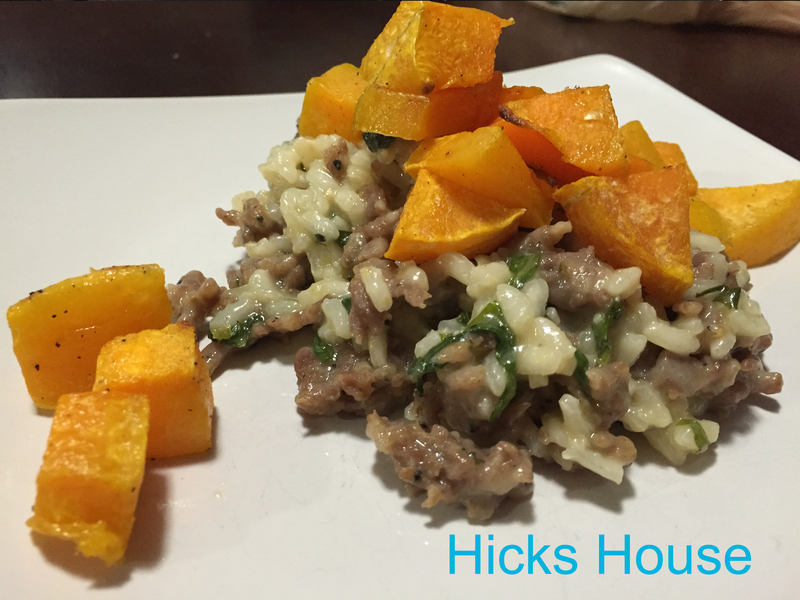 Top your risotto with the squash or mix it all in together and curl up in your little pocket of fall heaven. 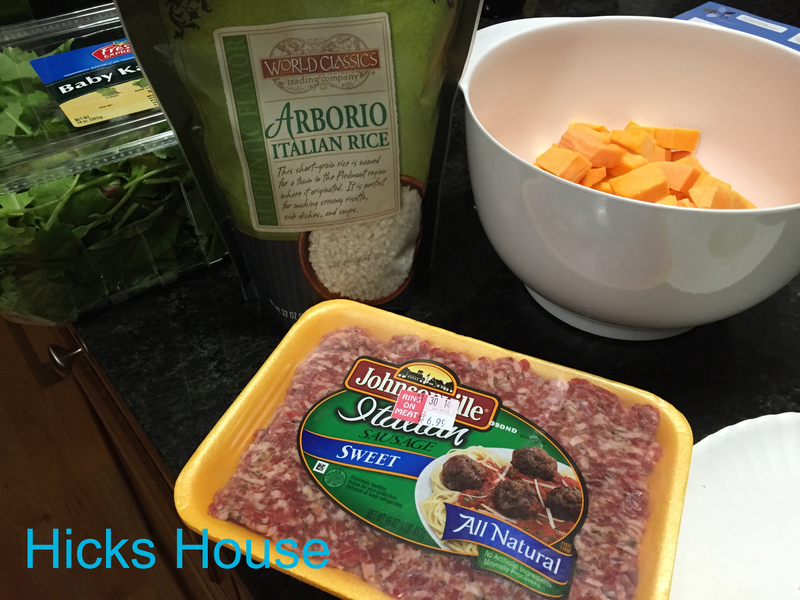 Categories: Recipes | Tags: butternut squash, fall recipes, healthy eating, kale, risotto, sausage | Permalink. I was asked by WeWork, to write about what I love about my work space. The request seemed to come at the perfect time as the craft room has been pretty neglected lately. Not only have I not written about the space in over a year (gasp!) I haven’t done anything to further customize the space in just as long. Although the room is still far from done, the request from WeWork to see pictures, sparked some momentum towards organizing the space. The original organizational idea centered around cube storage systems we had set up between the two windows. In theory this was great, it offered the choice between open shelving or pull out baskets… in practice not so much. The cubes were an odd size, in order to utilize them for fabric, it needed to be folded JUST right, and the pull out cubes required the fabric to be placed standing up, which would only work with the perfect folding job. Keeping everything so perfectly folded made me scared to use any fabric, and thus the cubes remained predominately empty for over a year. 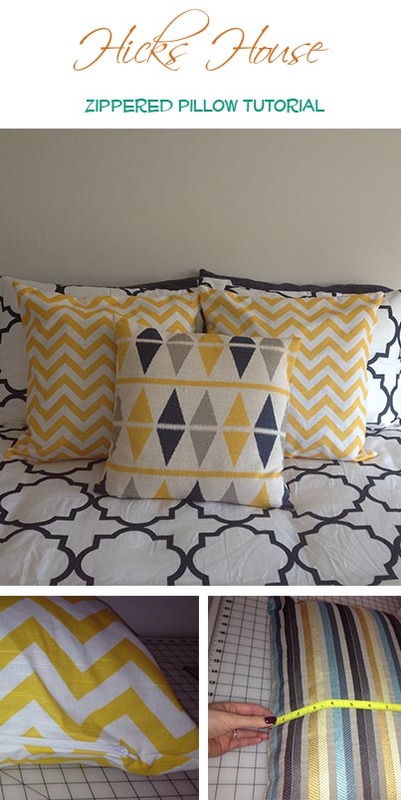 They were also set up in between the two windows which seemed to close the room in and would infringe on my future plan to make and display some beautiful curtains. Once I finally accepted that they were not going to work, Ken helped me map out and execute a new organizational plan. The small cube that housed the TV was turned on its side and one of the two massive cubes was moved next to it to display the TV, creating a 3 cube high, 5 cube wide storage area that now works well for yarn storage. 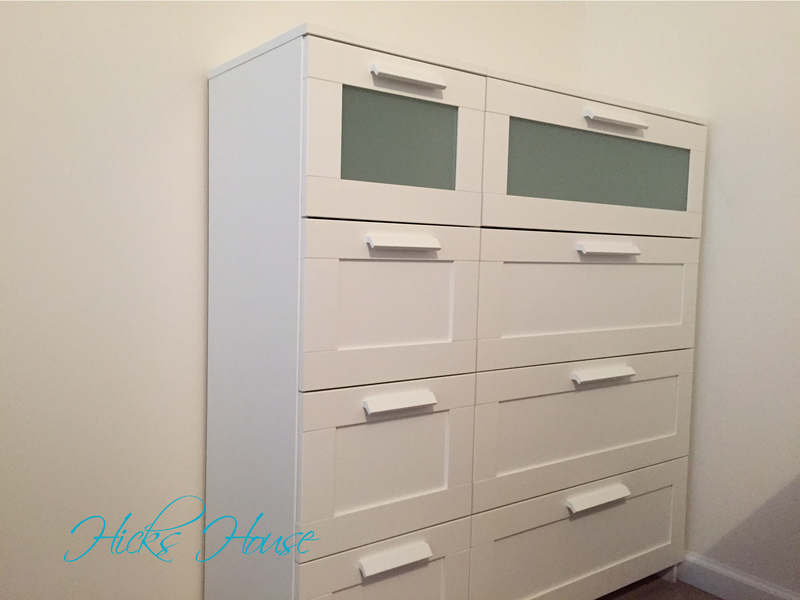 The second 3×3 cube was donated to a friend for their little girls playroom and replaced with two IKEA dressers. 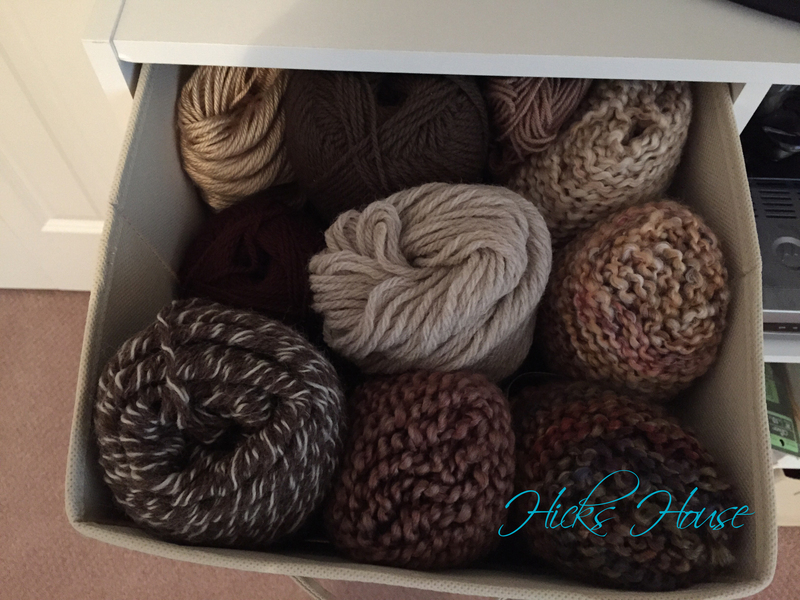 They offer the ability to keep my fabric organized in drawers and out of site, should they not be immaculately folded. What I love most about this room is that it is a sanctuary for all my crafts and projects that is now set up to best utilize the space. 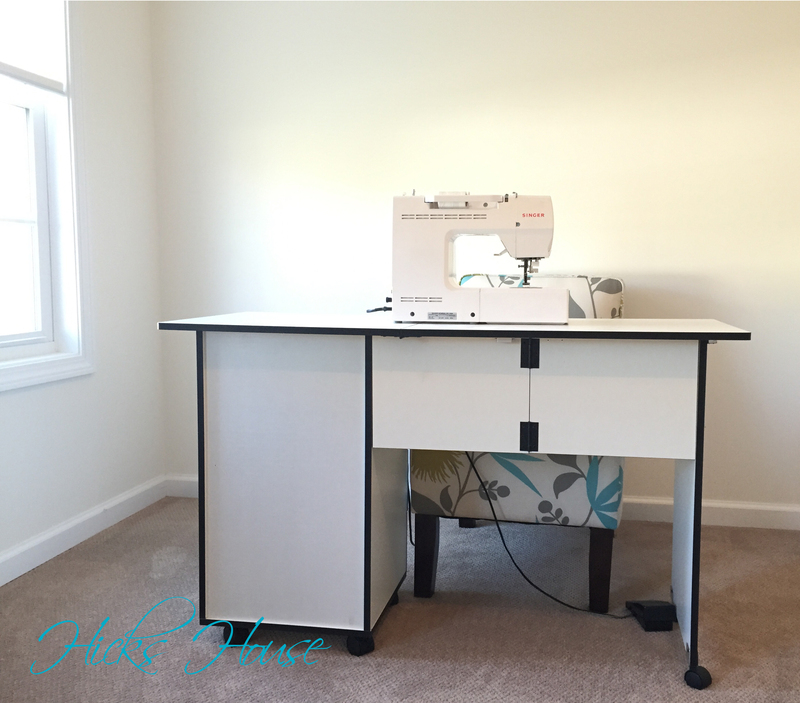 The sewing desk is right next to the fabric dressers which is next to the fabric cutting table. 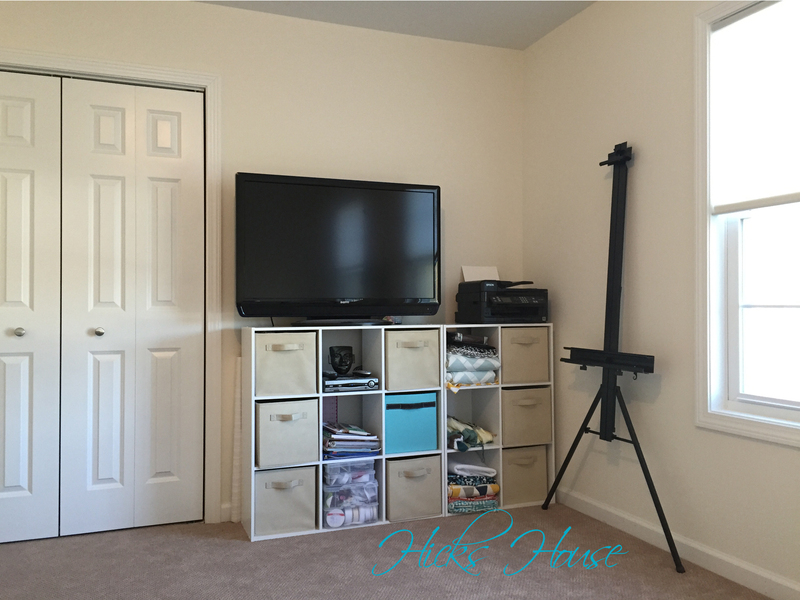 This area looks across the room towards the TV so I can watch HGTV while I’m working away (a must have feature). 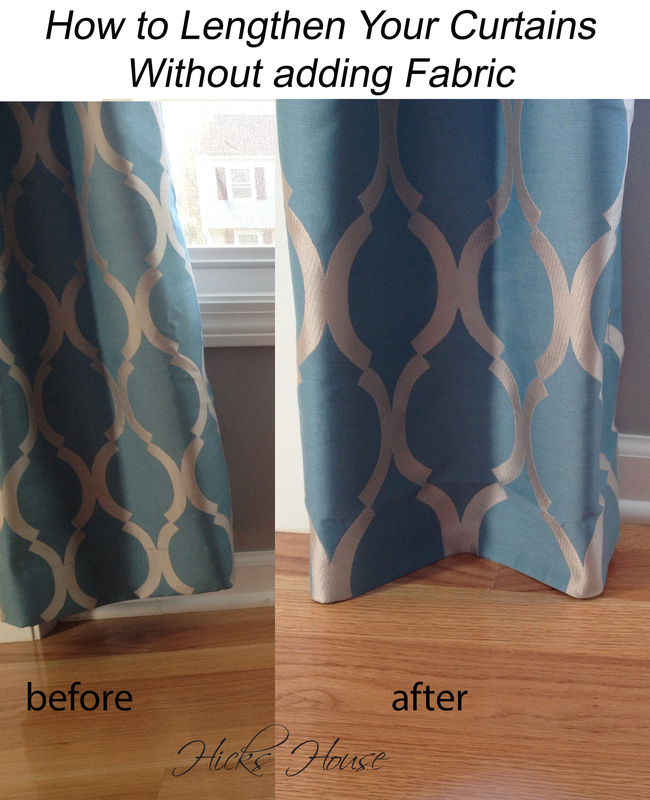 The windows are now free to accept my upcoming custom curtains and the whole room feels light and bright. So what do you think? 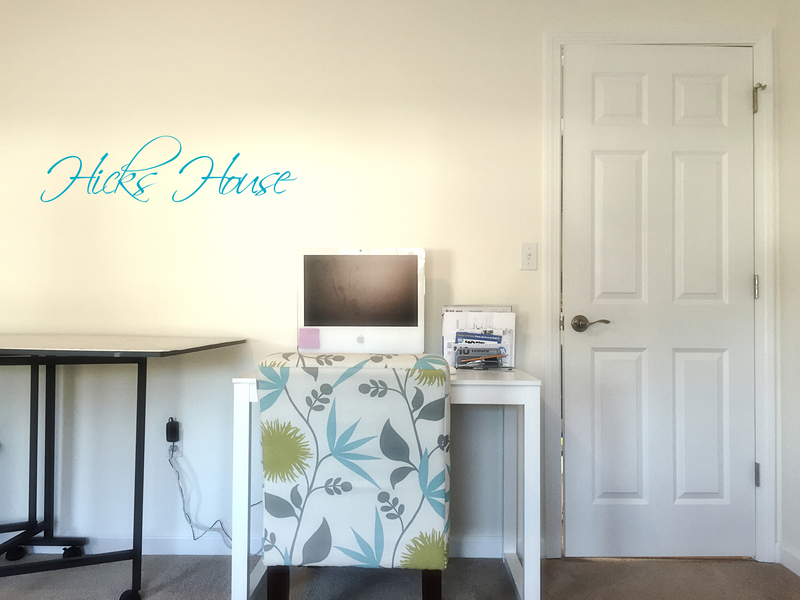 What do you love most about your work space? Check out some of WeWork’s other locations here. Categories: Craft Room | Tags: craft room, craft table, organizing, wework.com, work space | Permalink. 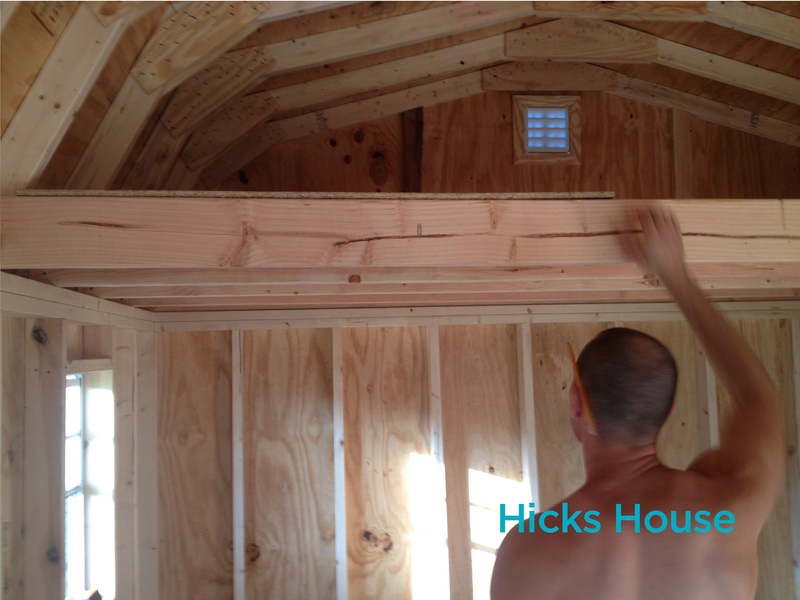 One would think that after all of the hoopla surrounding the shed foundation and the delivery of the shed that we would have immediately started using it for storage and moving all of our possessions out of the garage. 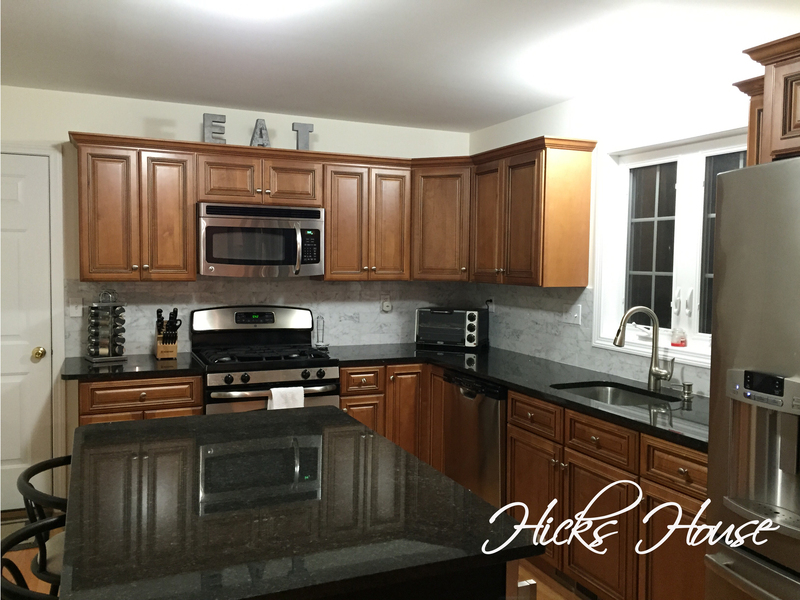 You must not be too familiar with this blog… nothing is ever that easy in the Hicks Household… everything must be customized :-). What the shed was missing was a loft, what better way to store things you don’t need constant access to without taking up space on the precious ground level? 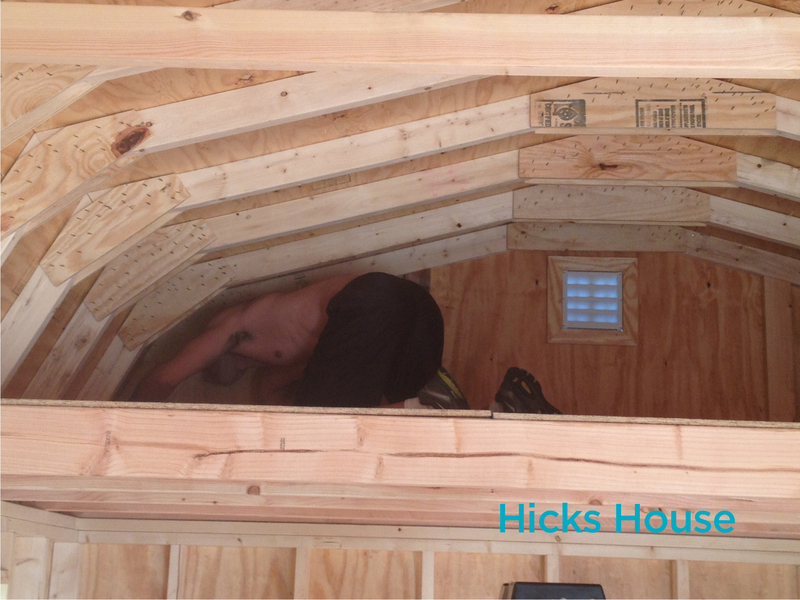 You may be wondering, how does one build a loft? Is it hard? Well I actually had no physical part in this, but I can say as far as difficulty that it only took Ken one day, and he was done by dinner time. 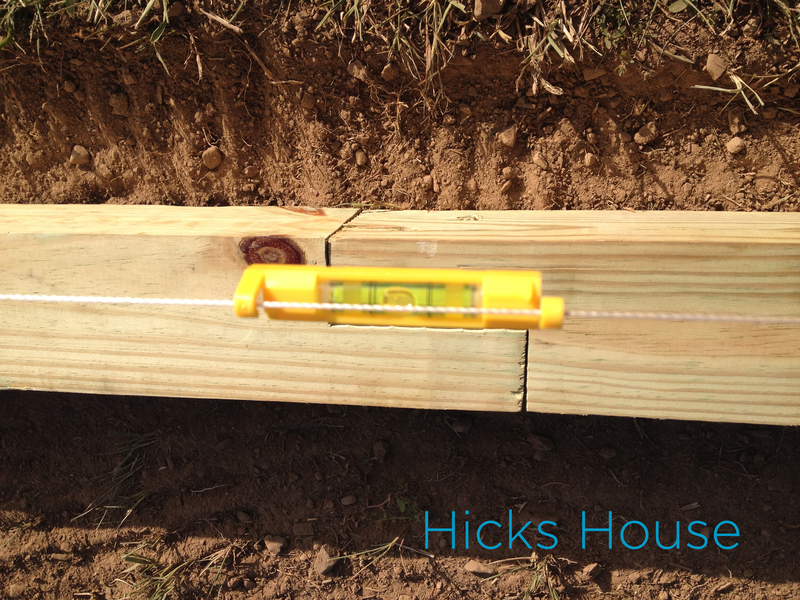 Ken was able to take advantage of that by cutting several two by fours to the length of the shed and attaching them to the existing supports with wood screws. 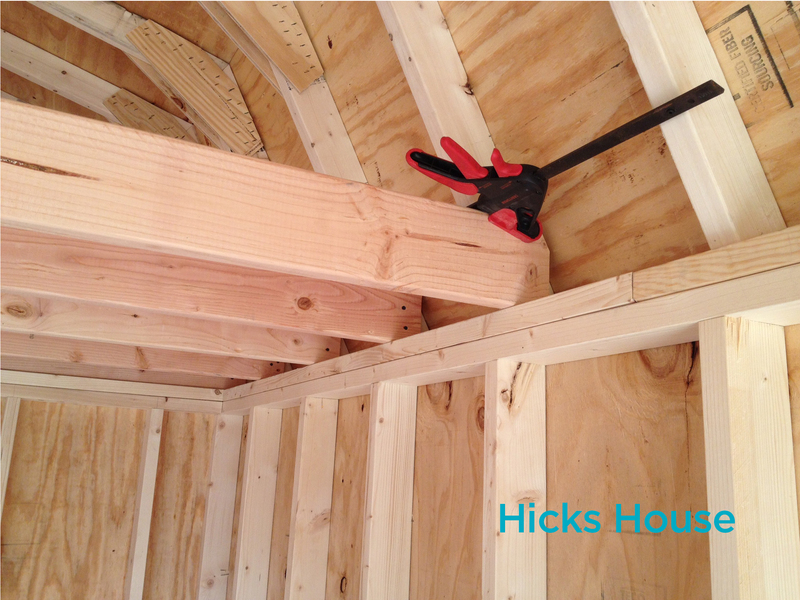 He then measured the length and width of where the loft would go and cut some mdf boards to fit. It ended up using 2.5 boards with the larger ones on the sides and a skinnier one in the middle. (I did help with this part, holding the mdf still while he cut – I like to think I played an integral part in this project but I’m not fooling anyone). And then Ken crawled up there and used nailed them in along the supports to ensure they didn’t go anywhere. Now its all ready for extra storage space! Once we’ve filled it, we will finally have both cars in the garage! Just in time for fall and the upcoming cold temperatures. 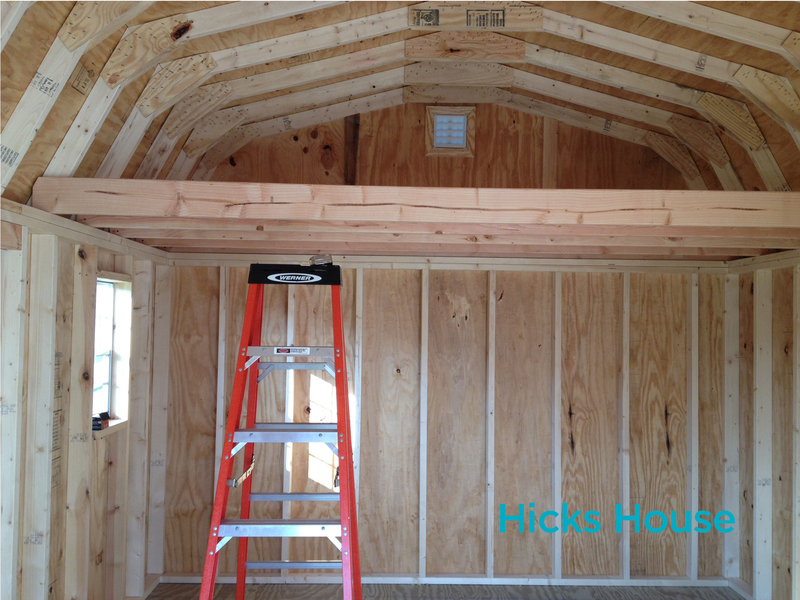 Categories: Outside, Tutorials | Tags: diy, extra storage, handyman, how to build a shed loft, shed loft | Permalink. Fall is in the air, the grill is on the outs and the oven is back as the main cooking star. 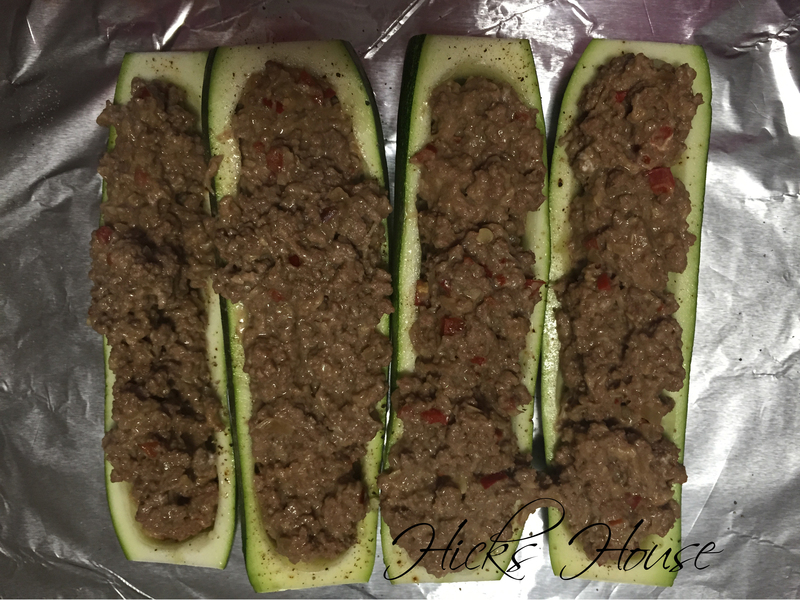 These Stuffed Zucchini Boats combine the fresh summery taste of zucchini with the heartier flavors and texture of ground meat (with a little creamy cheese thrown in for good measure). 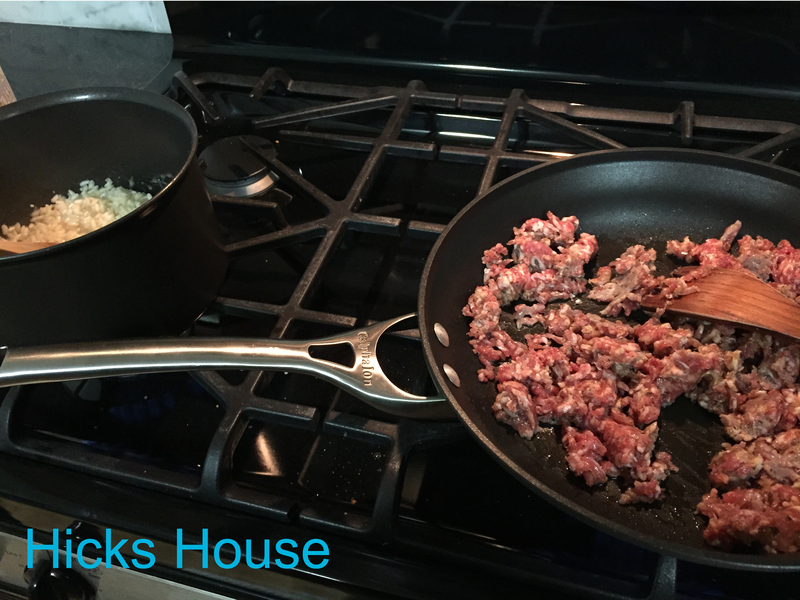 1 lb ground meat of your choice – I used bison, but have used turkey in the past, ground beef would the kitchen staple go-to for most kitchens. Preheat your oven to 400. Cut the ends off your zucchinis, and cut in half lengthwise. 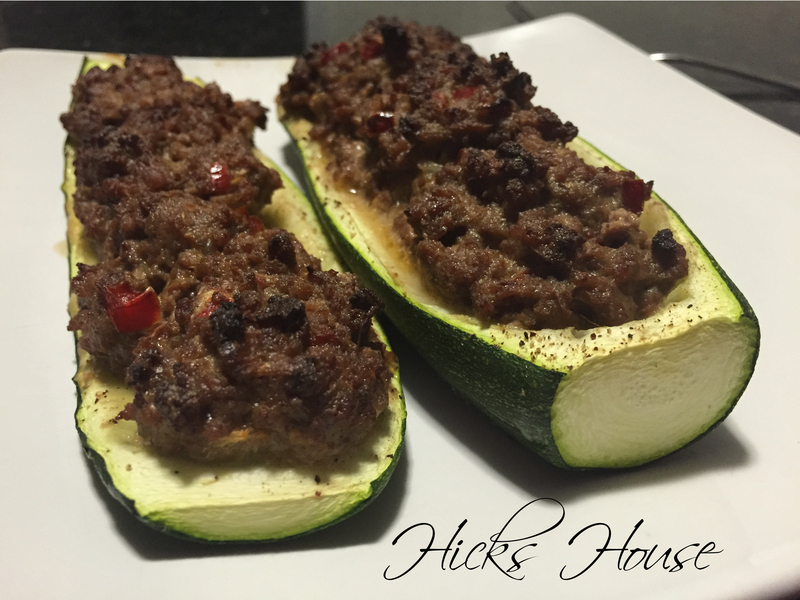 Using a spoon carve out the middle section of the zucchini, reserving the fillings – this will go into your stuffing. Place your boats on a foil lined cookies sheet and sprinkle with black pepper. 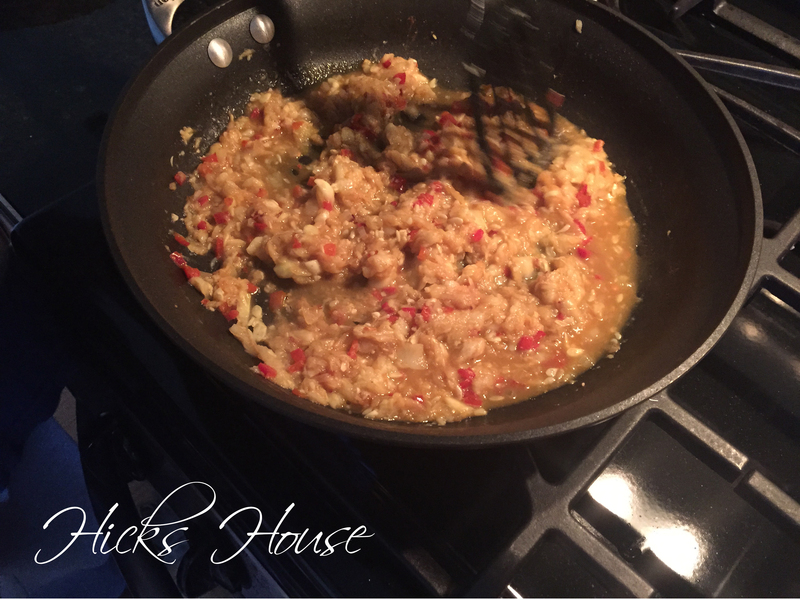 In a large skillet over medium heat saute your peppers, onions, garlic and zucchini centers. Season with chipotle, red pepper flakes and black pepper to your liking. 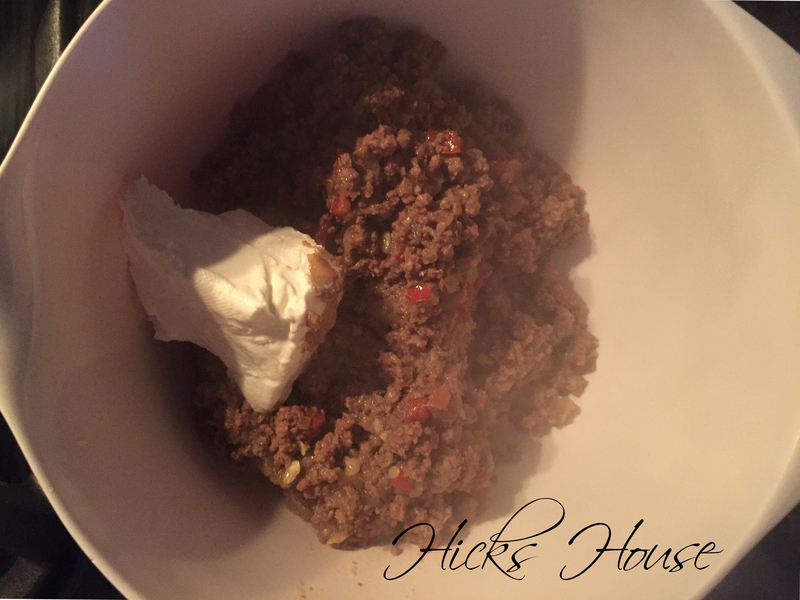 Transfer your filling into a large bowl, add cream cheese and mix. Spoon the stuffing mixture into your boats. 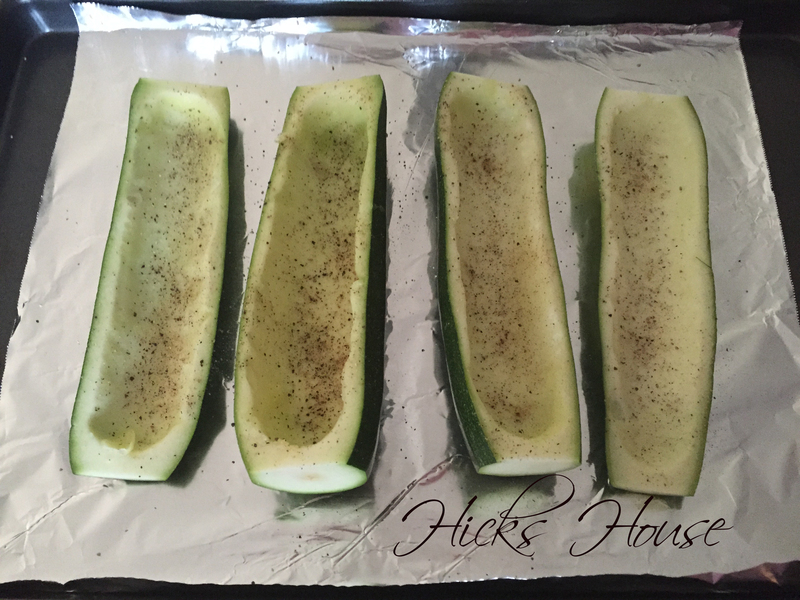 Place in your preheated oven for 30 minutes until the zucchini is cooked through. Serve and enjoy! 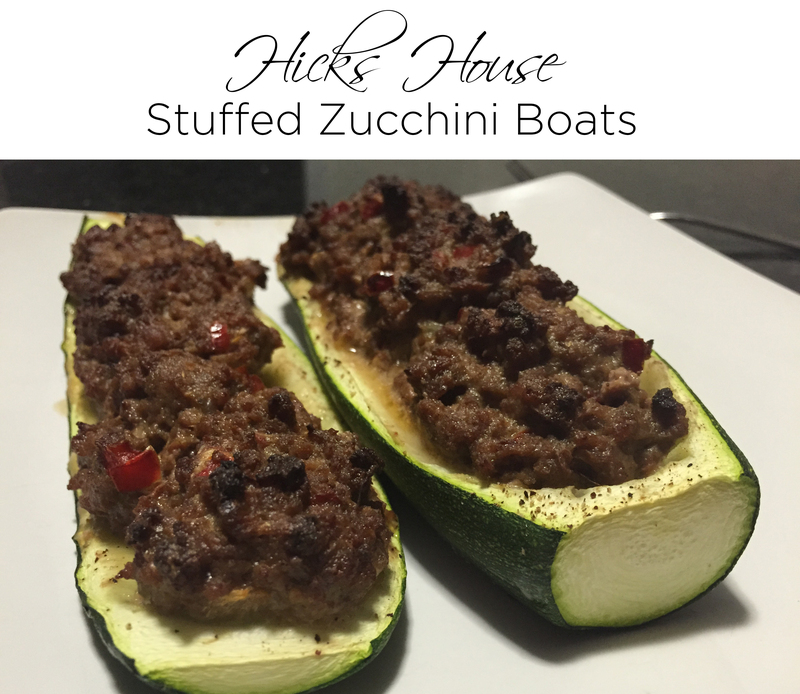 Categories: Recipes | Tags: fall recipe, healthy eating, healthy recipe, stuffed zucchini boats, zucchini, zucchini recipes | Permalink. 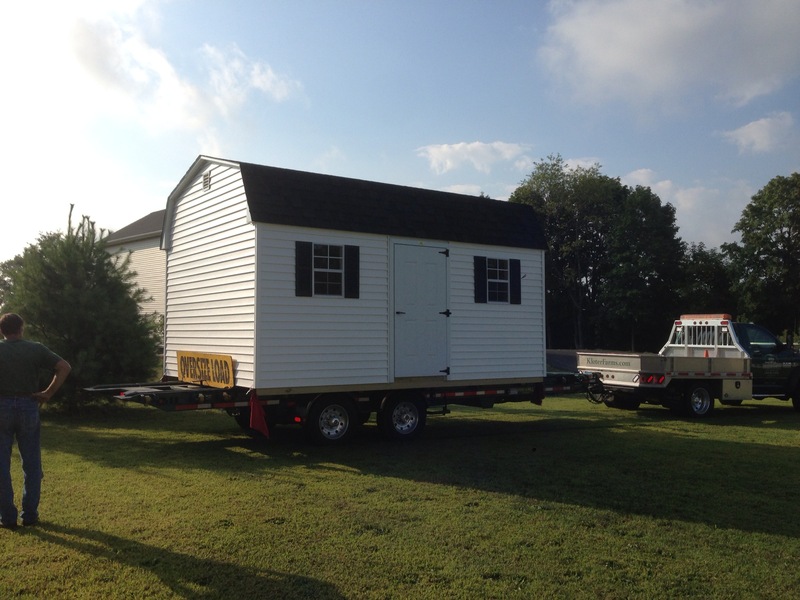 If you’re keeping up, you already know that we’ve ordered a shed. Ken has been preparing the site for a couple of weeks. After the crushed stone was delivered he was concerned that the constant pressure of the stone pushing out on the wood would eventually cause it to bow out. Especially come winter should it rain and then freeze. Ever the fixer, Ken devised a plan to address this. He purchased 8 foot long ground stakes. 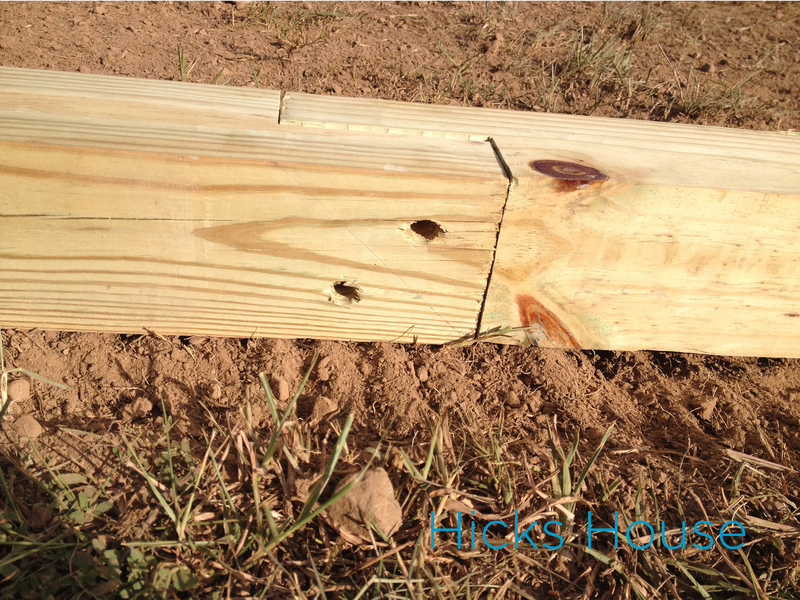 Pre drilled 2 holes equally spaced apart on each side. 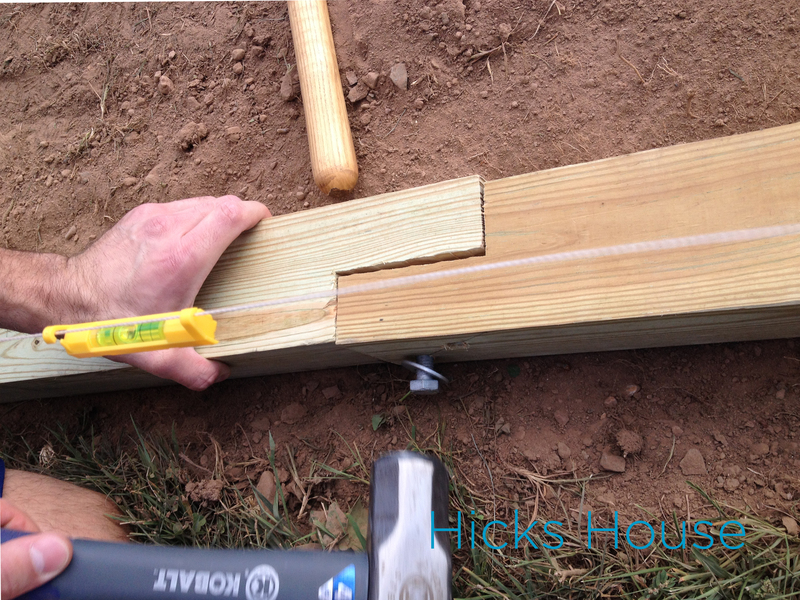 Then used a 5lb hammer to hammer in the stakes. Just in time for the shed delivery! I unfortunately missed it as I had to go to work, but Ken got some great shots of them lowering it off the truck. 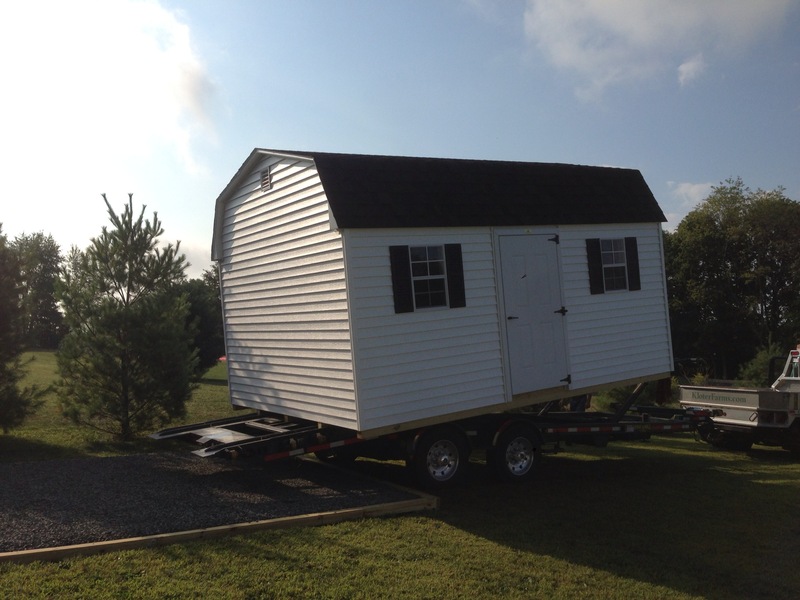 The shed is huge 16’x20′ and looks like a mini version of our house. Once all of the items being stored in the garage are organized and moved out here, we will be able to both park in the garage for the first time since moving into this house over a year ago. Just in time for the ugly New England winter (I am soooo not ready for winter). What do you think? 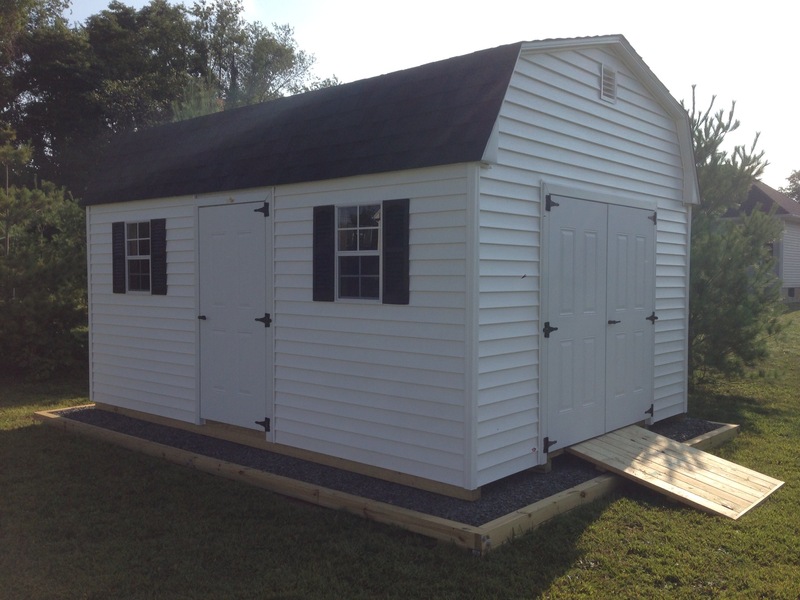 Is your shed a life and space saver? 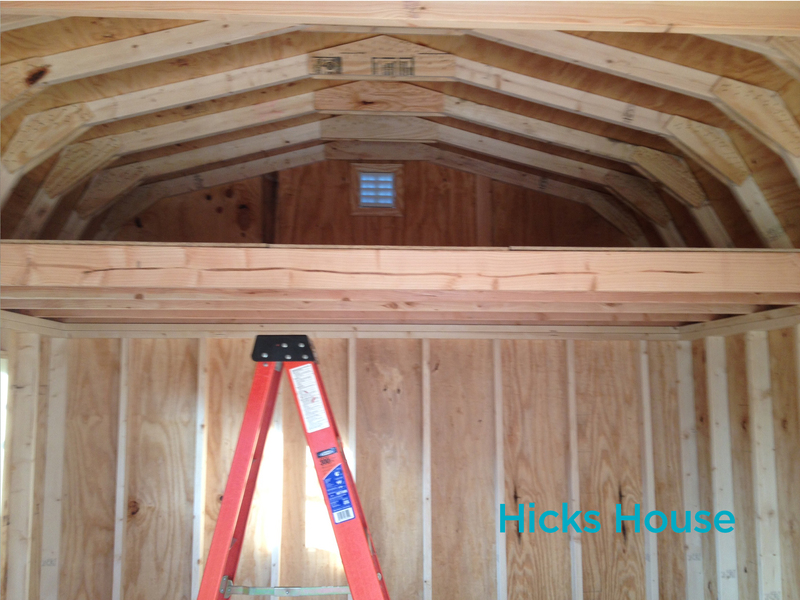 Categories: Outside, The Hicks | Tags: garage, shed, storage, storage shed | Permalink. After over a year in our house, the day is finally approaching where we will be able to park both cars in our two car garage. Yes, you read that right TWO cars in a two-car garage. To some, this may seem like an obvious thing that would happen right at the beginning, however half of our garage has been devoted to the storage of the essentials (such as the riding mower, the snow blower) and the recreational (two dirt bikes) that prevented the second bay from being used for a car. My friends that is about to change. 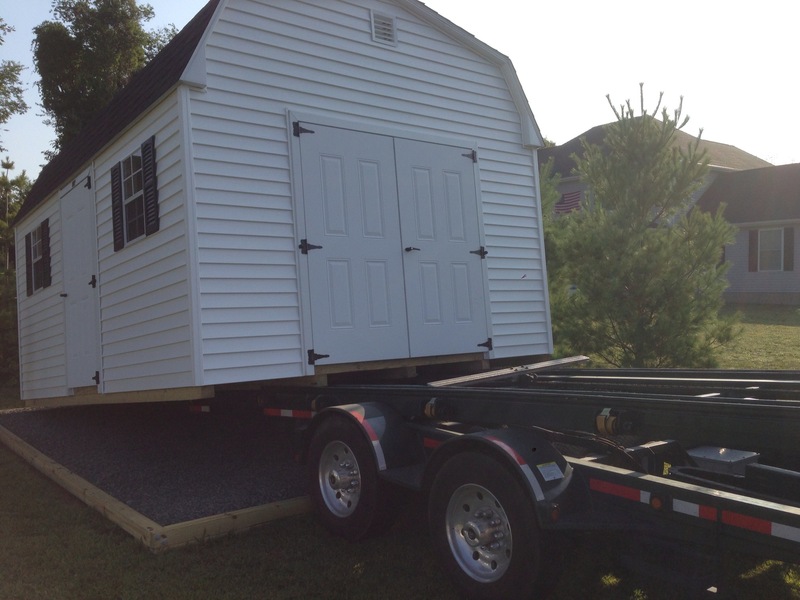 That’s right, we’re getting a storage shed. 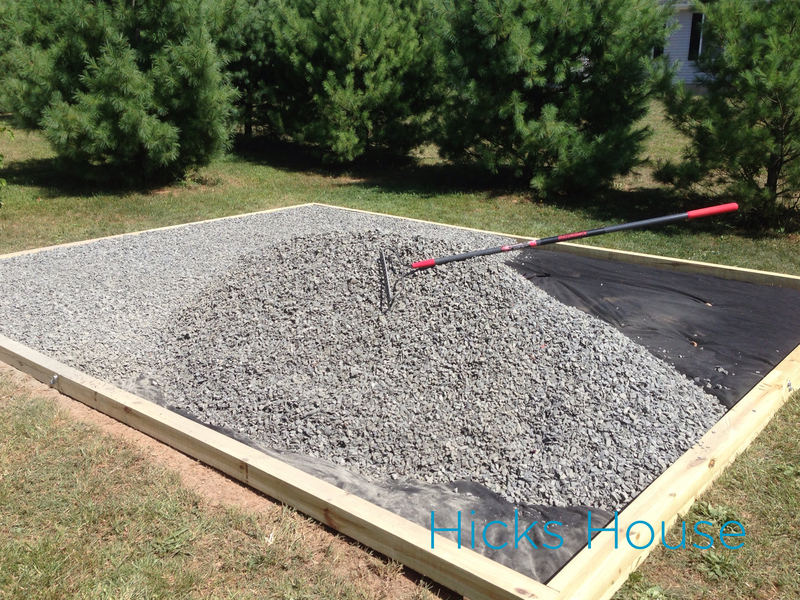 Before any good shed can be delivered a base foundation needs to be set up. 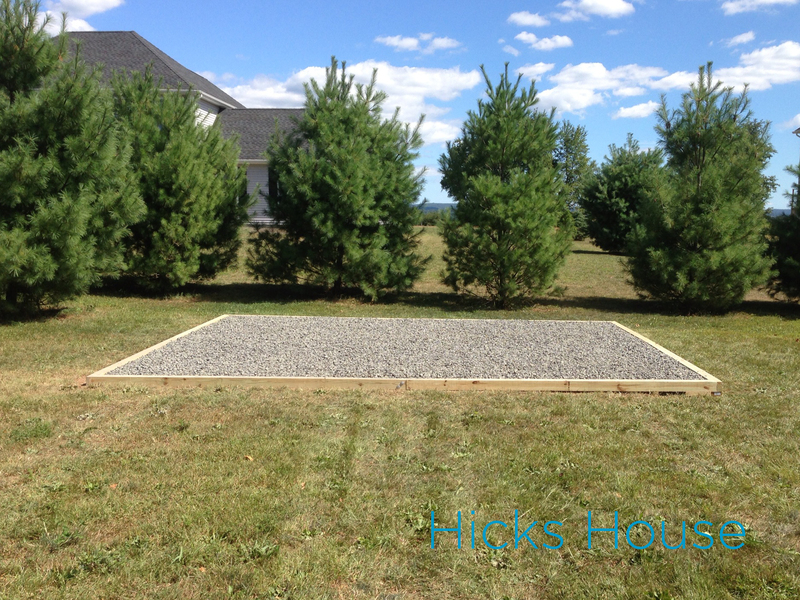 The retailer we purchased the shed from suggested crushed stone in an area one foot larger on all sides than the shed – that’s all well and good, but not very tidy – crushed stone could get everywhere. Not to worry, Ken had a plan. 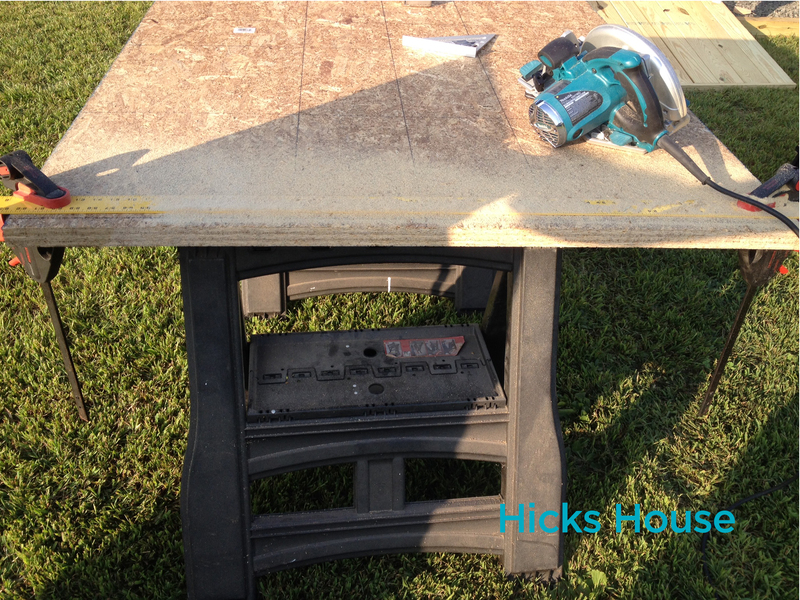 He purchased several pressure treated 4×4’s and cut them to the lengths he needed plus 4 inches (I would go into super specifics but the overall length is dependednt on your base) used a dado blade to create lap joints that would overlap creating a longer base than the original 4×4. (you’ll see this in a later photo). 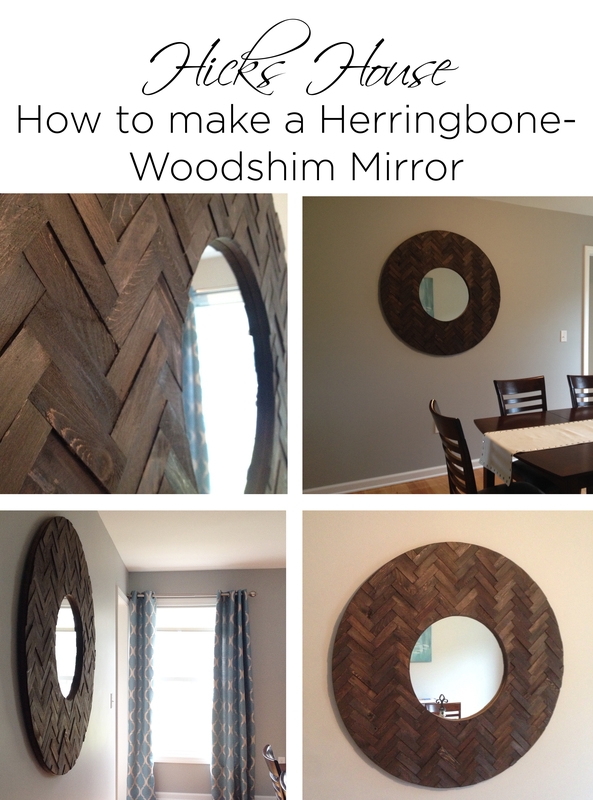 Here is a video we found online on how this is done watch here. 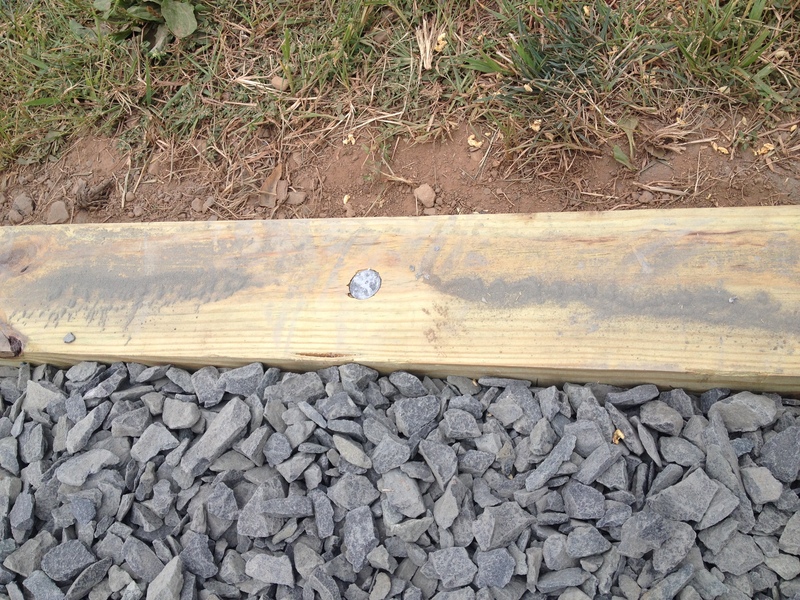 He then drilled those diagonal holes you see in the above shot. 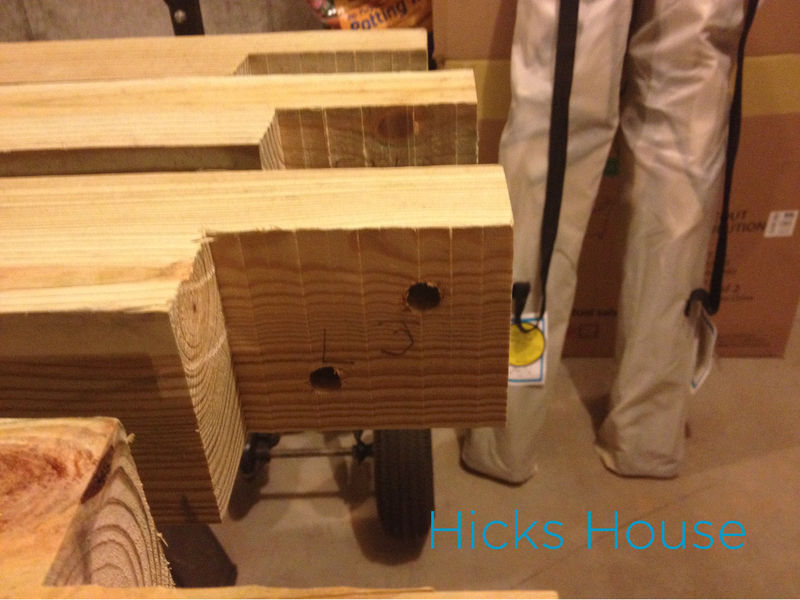 These are for the 6″ galvanized metal lag bolts that will hold the two pieces together. 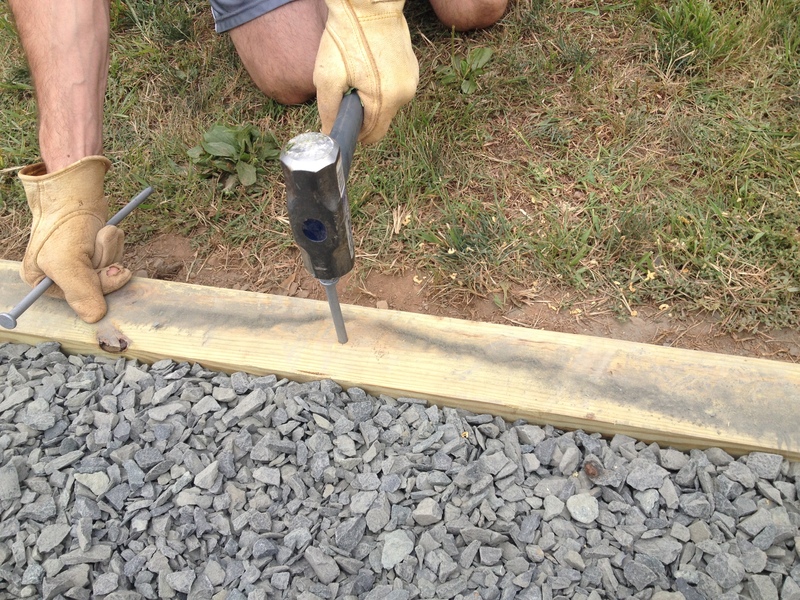 Before we could move all the wood outside, the site needed to be measured out and leveled. 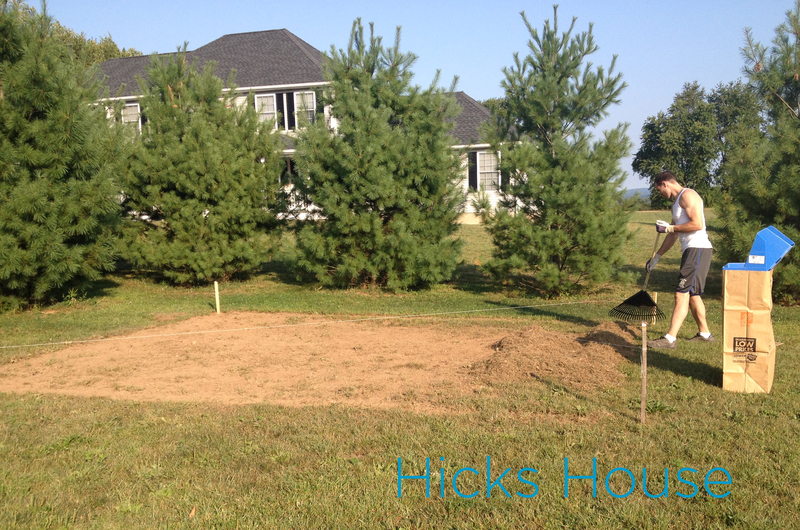 This was mostly handled with a small tiller used to dig down the high spots. Then we brought out all the wood pieces 8 in total and laid them out making sure they were level. This took some finagling. 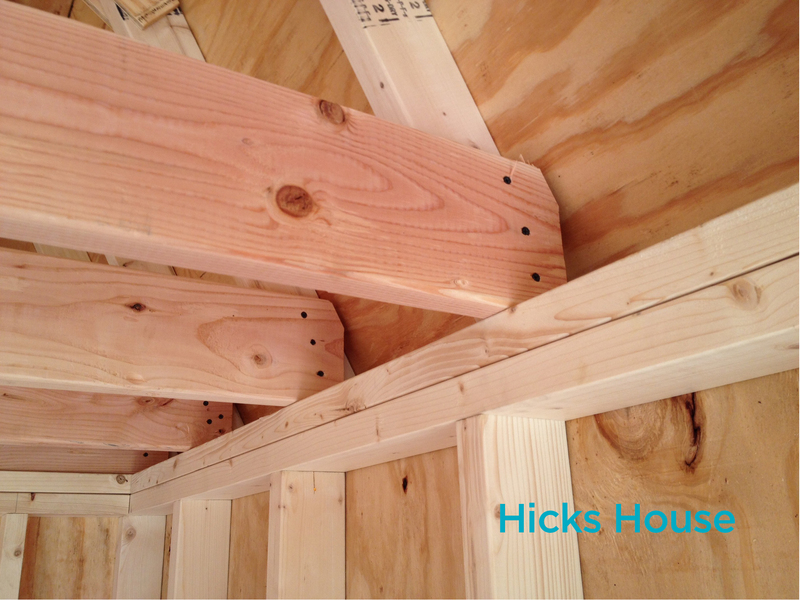 And here is a photo of the lap joint lined up and ready for the bolts. The bolts were hammered in with a washer between the bolt head and wood. Then they were secured with a washer and nut on the opposite side. 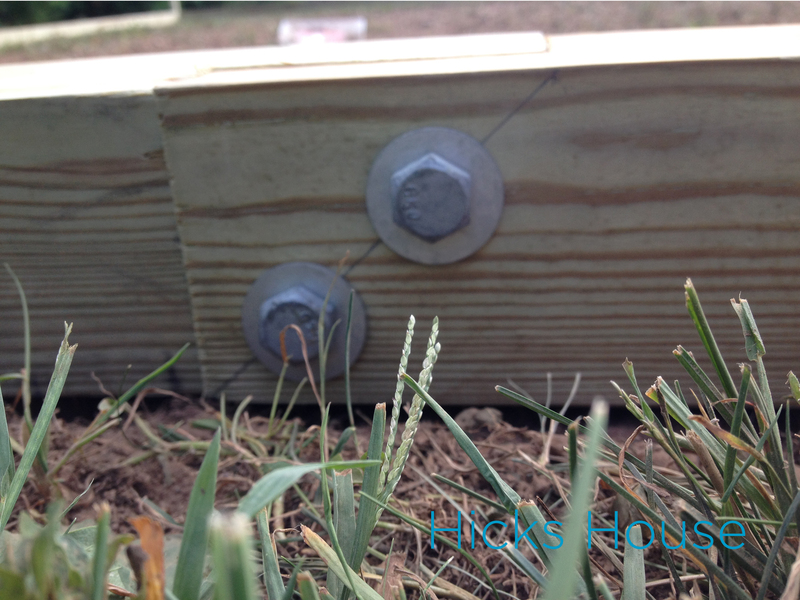 Here is a close up of the pieces bolted together as well as some of our weeds. 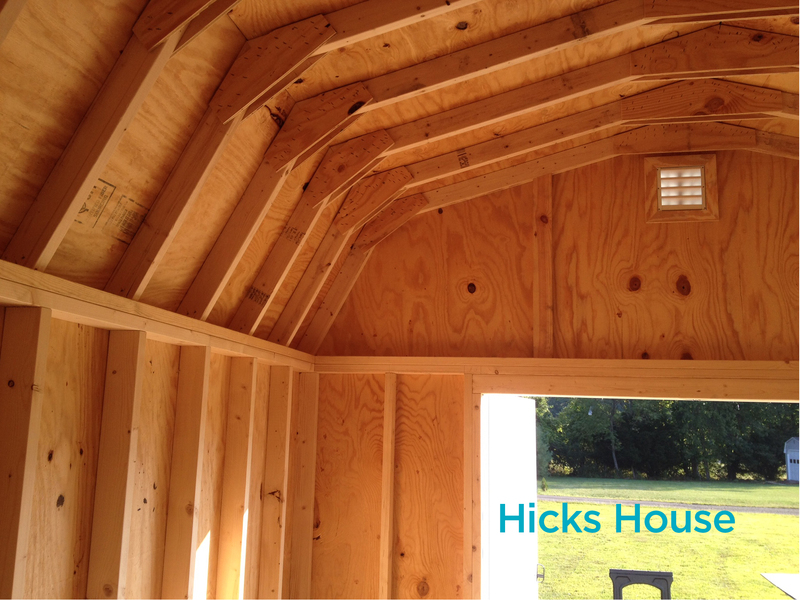 The entire structure then had to be lined in landscape fabric. 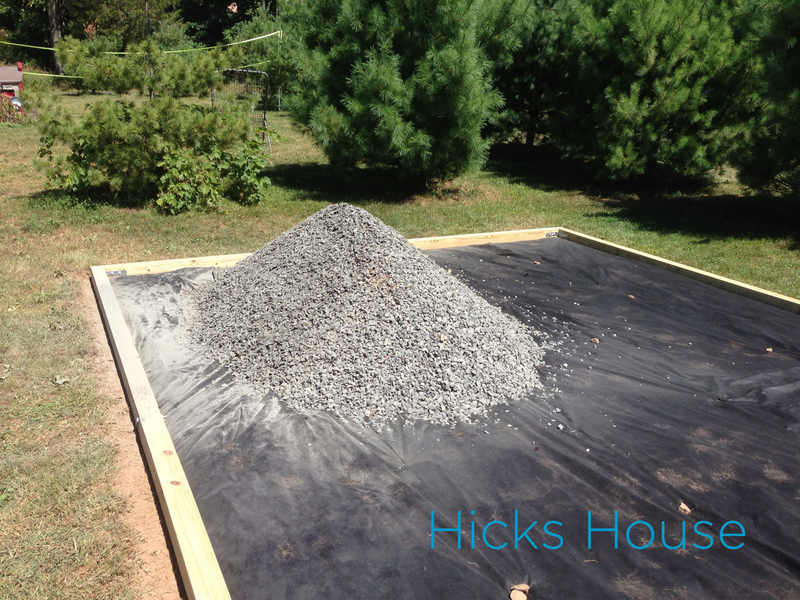 Then filled with the crushed stone. Several tons worth. The place Ken ordered the stone from was willing to do this in two loads so they could drive up to the base and dump inside it rather than dump one huge load in the driveway that would then need to be transferred, or drive the humongo truck over our lawn and rip up all of our “lush vegetation”. 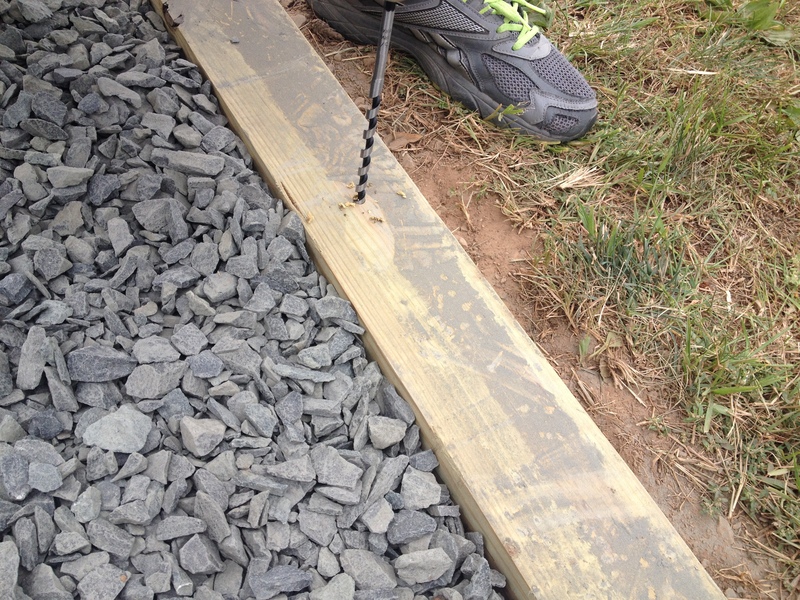 Ken used a rake to spread the stone out and that’s all for now folks! I’ll be back next week with an update on how Ken added some extra support to prevent the wood from bowing out over time due to the weight of the stone and shed delivery. Is it normal to be super excited about having both cars in the garage? Or is it something most people take as a duh! That’s what a garage is for! 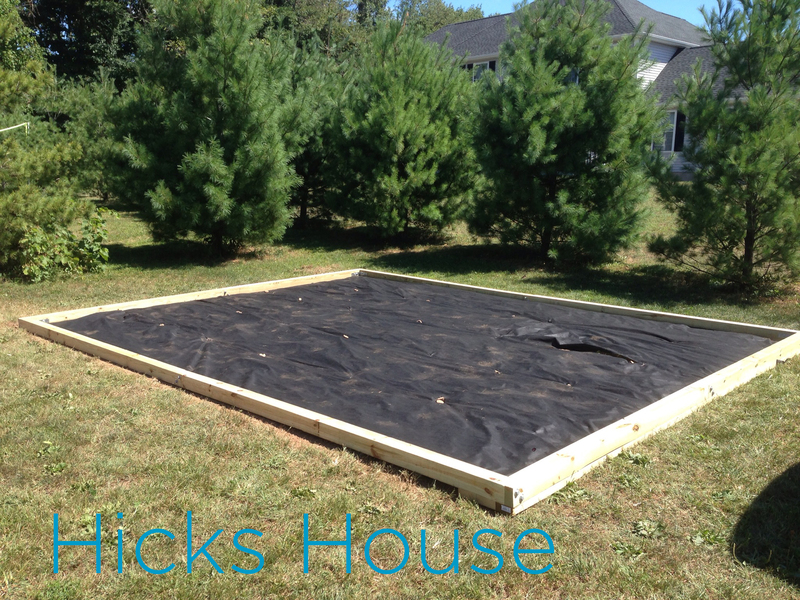 Categories: Outside, The Hicks | Tags: building a shed base, crushed stone, dado blade, lap joints, storage shed | Permalink.